When a nerve root in the spine is injured or irritated it can produce unbearable neck or back pain that may radiate to your arms or legs. Selective Transforaminal Nerve Root Blocks under Fluoroscopy Guided-Image Technology is a quick, safe, effective alternative solution for treating pain associated with a pinched nerve. A Selective Transforaminal Nerve Root Block involves directly injecting a mixture of anesthetic and anti-inflammatory medication into the epidural space of the affected nerve. 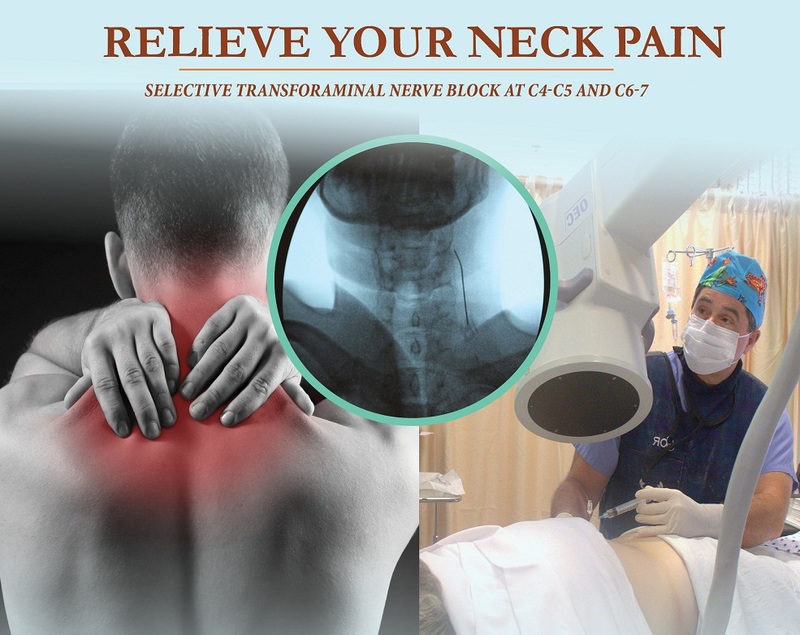 By appropriately treating your neck or back pain, you can quickly recover to your optimal physical and functional abilities, thus improving your quality of life. *If a facet joint is arthritic, injured, or irritated, the surrounding nerves send pain signals to the brain. *Lower back pain can be devastating and interfere with daily activities and the overall quality of life. *A facet radiofrequency neurotomy/ablation involves heating the medial branches with a filament placed near the sensory nerve using Fluoroscopy Guided-Image Technology to disable the sensory nerves that innervate the facet joints. 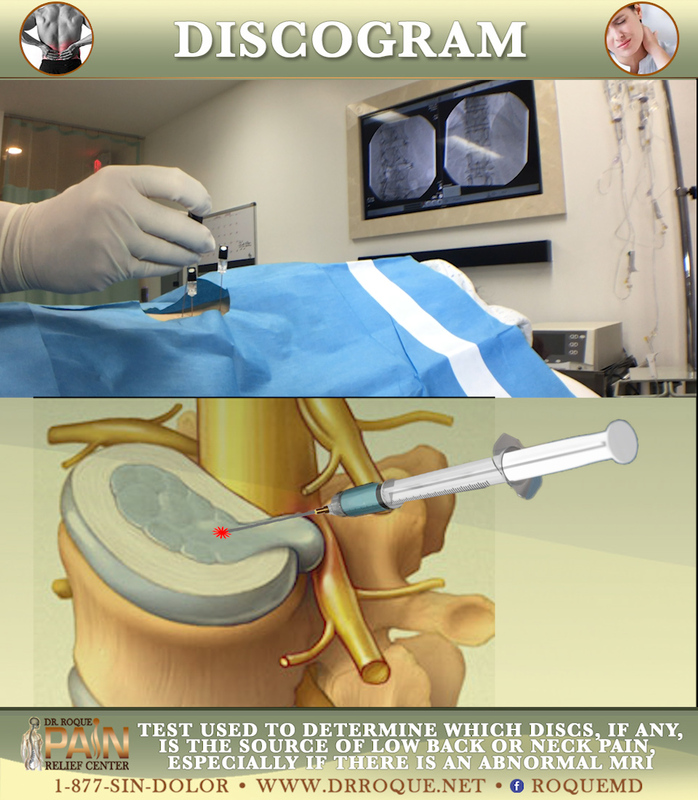 A Discogram is a test used to determine which disc or discs, if any, are related to your pain. 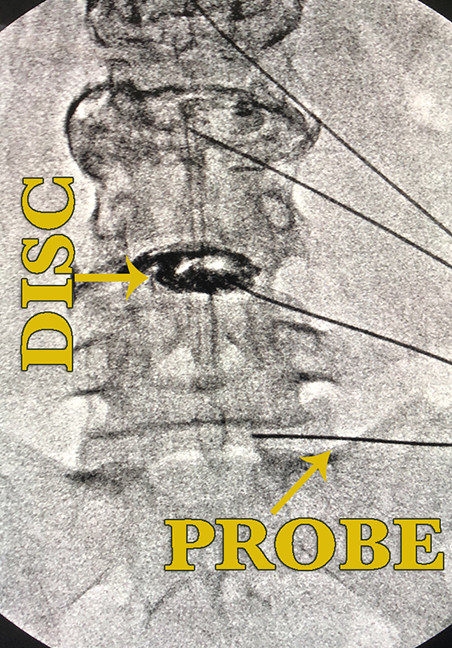 Many people have discs that look abnormal on an MRI, and the DISCOGRAM is the best study to determine if that disc is the pain source. Discogram or Intradiscal Injection. An intradiscal injection may be performed by injecting the disc with cortisone and anesthetic medication. The discogram is a procedure in which a contrast solution (dye) is injected into the intervertebral disc to show its form and structure. It will show the presence of tears in the disc, and offer an explanation for your pain whether it is related to the disc. An intradiscal steroid injection is done to relieve pain. The discogram is done for diagnostic purposes to aid in the evaluation of your pain, as to where the source is ordered to identify painful discs in the spine. This procedure is purely diagnostic in that it will only help your physician to determine if one of the discs in your spine is responsible for your typical pain symptoms. A discogram has two parts. First, a needle is inserted into the problem disc, and saline is injected into the disc to create pressure inside the disc. The human vertebral disc is a unique structure in the spine that bears weight and allows motion. It is made of a central portion (the nucleus pulposus) which is surrounded by layers of tissue (the annulus fibrosis). The disc helps the spine support the body and allows movement between the vertebra. In a normal disc, there are nerves only in the outermost layers of the annulus fibrosis. The layers of the annulus may tear as a result of overloading the spine or lifting in an awkward position. These tears may trigger a series of events that can cause pain. As the disc tries to heal (which is a slow process), new nerve endings may form in the injured area. The nucleus pulposus of the disc contains a lot of water, which lets it bear weight and transfer load much like pressing on a water balloon. The contents of the nucleus of an injured disc may leak out into the outer layers or all the way through those layers to the nearby nerve roots exiting from the cauda equina (the lower end of the spinal cord). The nucleus contains chemicals that are very irritating to nerve tissue. As this fluid leaks, it may come in contact with the sensitive nerve endings in the outer disc and cause pain. These chemicals may also make the nerve endings more sensitive, so moving that was not painful in a normal disc may cause pain in an injured disc. The irritating fluid from the nucleus may leak out of the disc and onto the nerve roots, producing pain. These events in the disc may also trigger disc degeneration.